Once dug, the canal needed a light to help mariners locate it. In 1872, the Corps of Engineers advertised for proposals to build a beacon on the outer end of the south pier. That year a small dwelling for the light’s keeper went up on shore, but a storm ripped apart the pier’s wooden breakwater, delaying work on the light itself until 1873. After repairing the breakwater, contractors built a wooden pyramid tower and capped it with an octagonal cast-iron lantern housing a fifth order Fresnel Lens (a lens developed specifically for navigational lights by French physicist Augustin-Jean Fresnel). The light, which cast a red beacon visible 12.5 miles away, was lit for the first time on June 2, 1874. In 1877 the light was upgraded with a fixed red fourth order Fresnel lens. The western tip of Lake Superior had already gained a reputation for extremely thick fog. 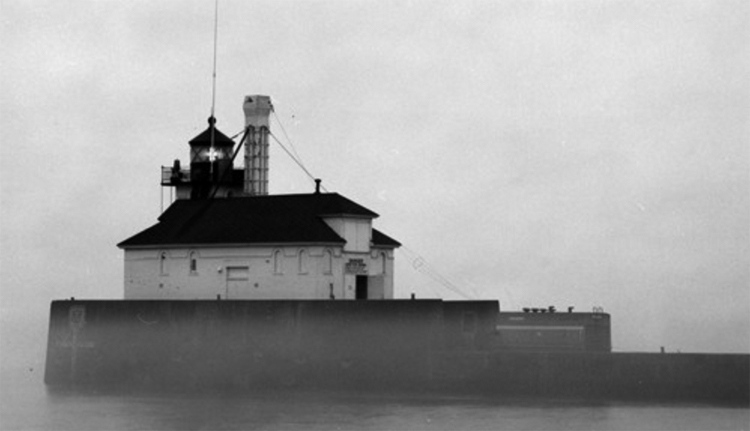 So in 1880 engineers installed an automated fog bell inside the light’s tower, but it proved inadequate. Five years later it was replaced with tin steam-powered fog whistles housed in a small structure near the light. Duluth experienced one of the foggiest seasons on record in 1895, and the fog-signal whistle screamed for over 1,000 hours, gobbling forty-five tons of coal in the effort. The whistles not only sent a warning to mariners on the lake, they also bounced off Duluth’s rocky hillside, creating a cacophony Duluthians couldn’t bear. To remedy the problem, the signal’s horns were relocated to the roof and covered with a parabolic reflector. The reflector not only directed sound away from the city, it nearly doubled the signal’s reach. The signal would be upgraded several times over the years. Building the new concrete piers at the turn of the twentieth century meant tearing down the shaky old wooden piers—and everything on top of them. In June 1900 contractors began constructing the new lighthouse, a single-story building forty-five feet long and twenty-two feet wide made of Cream City brick. A tower sprouted thirty-five feet from its east end; here workers installed the old tower’s lens inside a new circular cast-iron lantern that gave it a range of twelve miles. The fog signal was also installed, along with a new steel parabolic reflector to keep the hillside quiet. 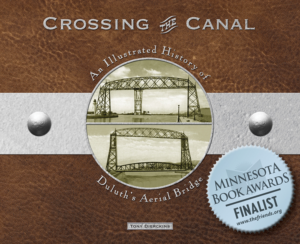 On September 1, 1901, the new light guided mariners to the canal for the first time. When the canal’s North Pier Light was first built in 1910 it cast a white beam. Later both lights were changed to be navigationally appropriate: the south pier was changed to green, and the north to red.